Senior Lamontray Harris notched his seventh double-double of the year, tabbing 19 points and 13 rebounds, leading the Morehead State men's basketball Eagles to their first conference victory of the 2018-19 campaign, defeating Tennessee State 74-61 Saturday evening at the Gentry Center. The Eagles improve to 5-12 on the year and 1-3 in OVC play. TSU regressed to 4-12 overall and 1-3 in conference action. "Tonight's message to my guys was to 'stay together'," said head men's basketball coach Preston Spradlin. "I can't say enough about how proud I am for coming together with a collective effort. Our team truly found out what it meant to come up against a squad that was as hungry as us, and who wasn't going to quit." The Eagles logged four players with double-figure performances. In addition to Harris, junior Jordan Walker chimed in 16 points, followed by sophomore De'Von Cooper's 12 and senior A.J. Hicks' 10. Morehead State outshot the Tigers, 44 to 41 percent, with the difference maker being the efforts from behind the arc. The Eagles connected on 8-of-16 (.500) from long range, while the hosts put up 4-for-22 (.182). Both teams jostled for position in the first portion of the opening stanza, as the two squads traded baskets back and forth with no one seemingly able to maintain a lead for long. The teams remained tied for 4:28 of the opening 10 minutes. Neither team led by more than four during this time. Then, as the first half passed its halfway point, Morehead State found its rhythm on both ends of the floor, establishing an emphatic run. Adding more credence to his role as a spark plug, freshman Ja'Cori Wilson got things started with a shot from downtown out of the left corner at the 9:16 mark. MSU forced one of its 13 first-half TSU turnovers before Harris found the cup on a breakaway layup. From there, it was Walker taking control with a triple from the top of the key and a couple of free throws to further extend the lead. TSU junior Tripp Davis stopped the onslaught for a moment, nailing back-to-back jumpers of his own. However, between each made shot, he was answered by the Eagle offense in the form of a made trey, first from junior Djimon Henson, then from Cooper. As it reached the close of the first half, Harris tallied a couple of free throws before sinking a mid-range jumper. TSU junior Michael Littlejohn found his way to the charity stripe to can two more tosses for the Tigers. But the Eagles answered the bell once again, as Cooper tabbed another long ball with 30 seconds remaining to bring Morehead State to the locker room with a 16-point halftime cushion, 35-19. Tennessee State's 19 first half points were the lowest for an MSU opponent since Kentucky Christian registered 16 points in the first half of its game against the Eagles in the 2016-17 season. MSU's defense also forced three shot clock violations in the opening frame. The half ended on a run that saw a final count of 25-6 in favor of the Eagles over the final 9:16. To start the second half, the conference foes traded shots back and forth, with MSU's lead shifting between 14 to 18 points up until the first media timeout of the period at the 15:37 stamp. As the teams came back to the floor, TSU utilized a full-court press defense that rushed the Eagle offense into four turnovers that materialized into six points for the Tigers to shrink the MSU advantage to 11, at 47-36, with 12 minutes to play. Once again, though, the Eagles weren't going to be denied, as the offense fired back with made shots from Cooper and Henson, along with some free throws from Harris and Walker, to stretch MSU's lead to its widest at 19 with 10:22 left to play. Tennessee State shrank its deficit to as few as 10 with 50 ticks remaining in the game. But, free throw shooting and defense down the stretch were enough for the Eagles to end their road trip with a victory. After spending the last four games away from Morehead, the Eagles return to Johnson Arena for a four-game homestand. The first game will feature MSU taking on Southeast Missouri. Tip-off is at 7:35 p.m. ET on Thursday evening. 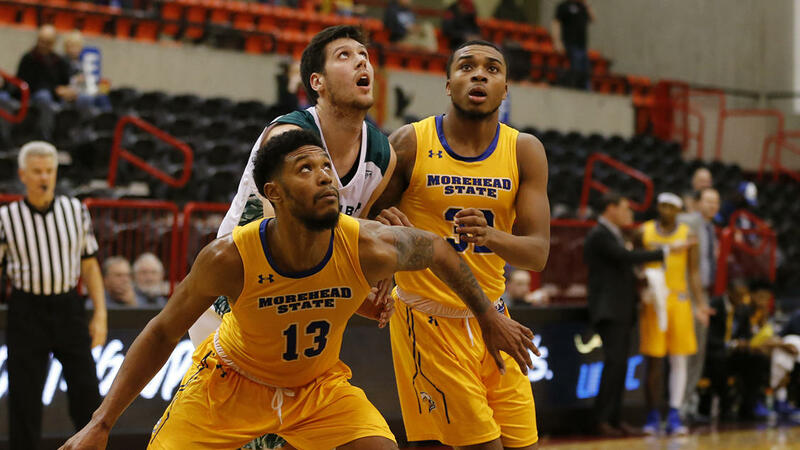 Morehead State drew double-figure performances from seniors Lamontray Harris and A.J. Hicks who scored 13 and 10 points. Tonight's performance was Harris' 13th in double figures this season, whereas it marks the 12th such night for Hicks. Sophomore guard De'Von Cooper joined the fray with 10 markers of his own, his fifth night with 10 or more. The Morehead State men's basketball team found the going tough on offense Saturday night at Austin Peay and ultimately fell 81-67 to the Govs at the Dunn Center. MSU slipped to 4-11 overall and 0-2 in the Ohio Valley Conference. The Eagles were led once again by junior guard Jordan Walker, who canned four three-pointers and scored 22 points. It marked his seventh contest with at least 20 points.